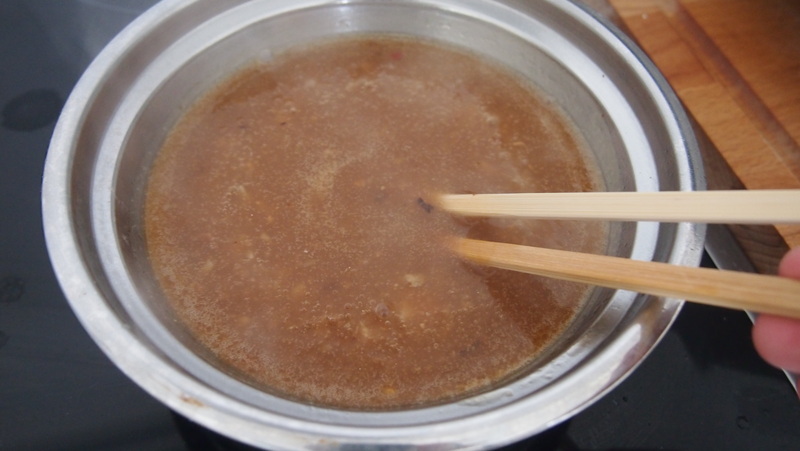 This is the first of my yong tau fu recipes: Ampang Yong Tau Fu 安邦酿豆腐. Ampang Yong Tau Fu is a twist of the traditional Hakka dish, by serving freshly fried pieces of yong tau fu in a sticky beanpaste sauce. 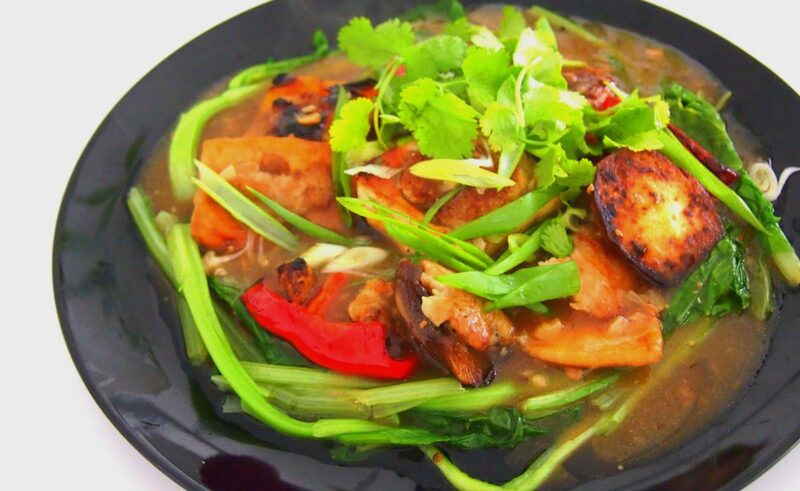 The dish is originally created by the Hakka community in Ampang, Malaysia, and is now popular in Singapore. For me, Ampang Yong Tau Fu is a dish that showcases how recipes can evolve when people move – a classic dish invented by migrant northerners in southern China which further blossomed when their descendants moved to Malaysia. Where the hell is Ampang? Ampang is an old town located partly in the Malaysian capital Kuala Lumpur, and partly in the state of Selangor. In the 19th century, Chinese migrants helped established a tin mine in the Klang Valley and this is when Ampang town was created and became the capital of Selangor in 1880. Ampang’s most famous son is Eu Tong Sen, the millionaire who built his fortunes by acquiring land for tin mining. He later ventured into Chinese medicine and today’s Eu Yan Seng – the international Chinese medicine store – bears his legacy. In 1872, out of the forty thousand Chinese miners in Malaysia, 10,000 of them were Hakka and were all located in Selangor, engaged in tin mining. The wealth and development of Kuala Lumpur, Ampang and the Selangor were created by these hardworking Hakka miners. While Kuala Lumpur was a Cantonese town (and still is), Ampang was a Hakka town. 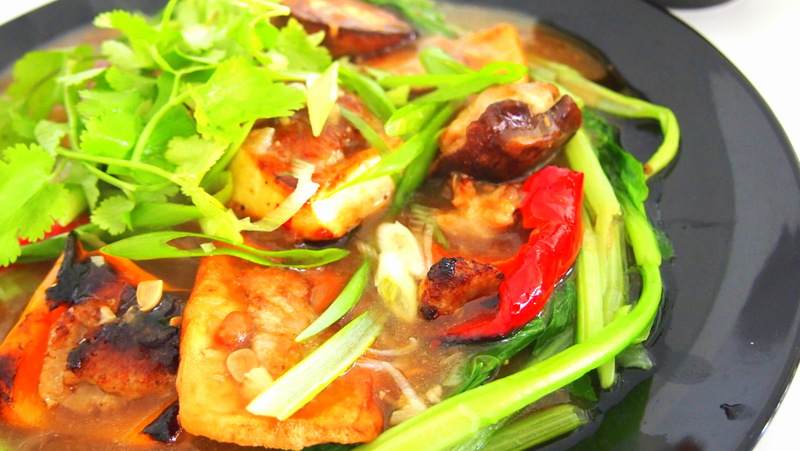 Urban legend has it that ampang yong tau fu was invented by a restaurant called Foong Foong, in the 1960s. It wasn’t called ‘ampang’ until the way they served yong tau fu became popular and seen as a novelty. Today, you can still taste the original Ampang Yong Tau Fu at Foong Foong when you visit Ampang. First we make the sauce. Heat up a small saucepan on medium heat with 1 tablespoon of oil. 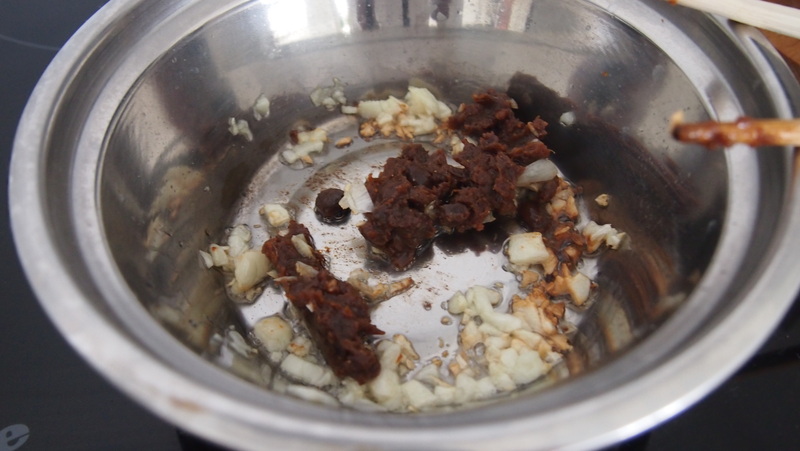 Stir-fry the garlic until brown and then add in your beanpaste. Do not let it burn. Add in the 300ml water, chicken powder, stir well and bring to boil then let it simmer. 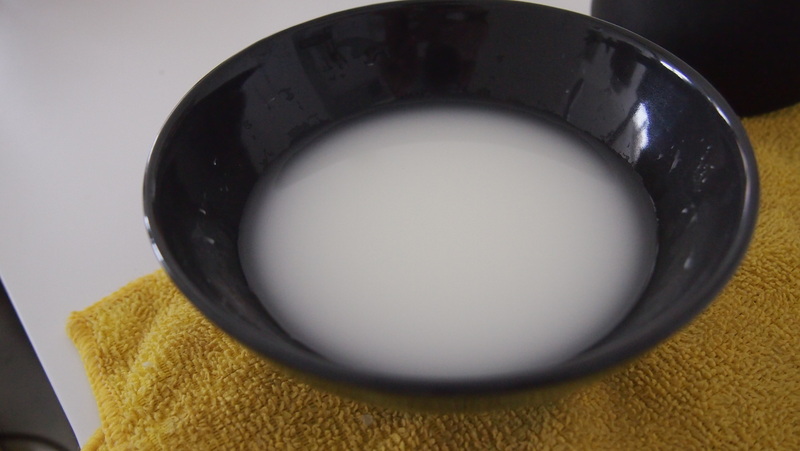 Meanwhile, dissolve your corn starch in 2 tbs of water. Slowly stir into the sauce to thicken it. Add salt to taste and let it rest on very low heat. 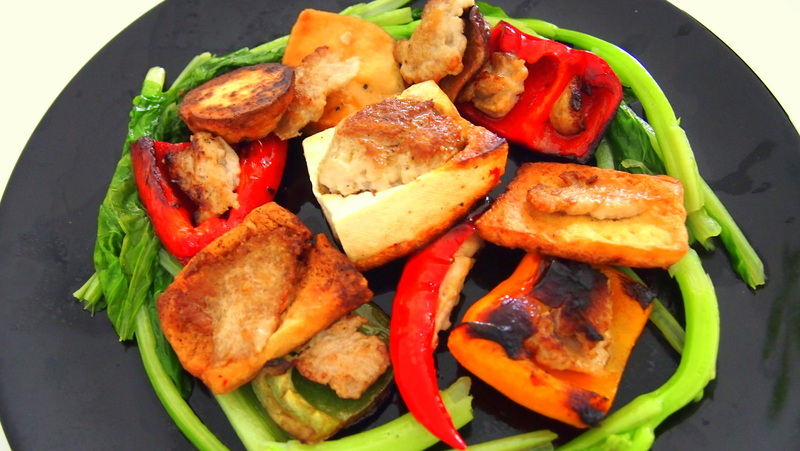 Heat up your wok with the 6 tablespoon of vegetable oil and fry your yong tau fu until crispy. 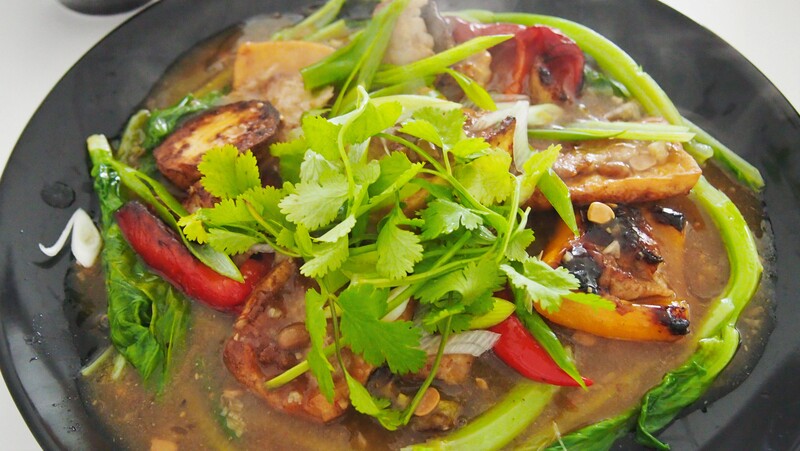 Place fried yong tau fu on serving dish, pour remaining oil away and fill wok with water. Bring your water to boil, blanche your greens. Place cooked greens together with yong tau fu. Pour the sticky beanpaste sauce over the yong tau fu and greens in the serving place. Add a dash of pepper. Serve with savoury chili sauce and steamed white rice. *Note: You can use the Chinese version of beanpaste, like in the original version of ampang yong tau fu, which you can still see the soybeans. 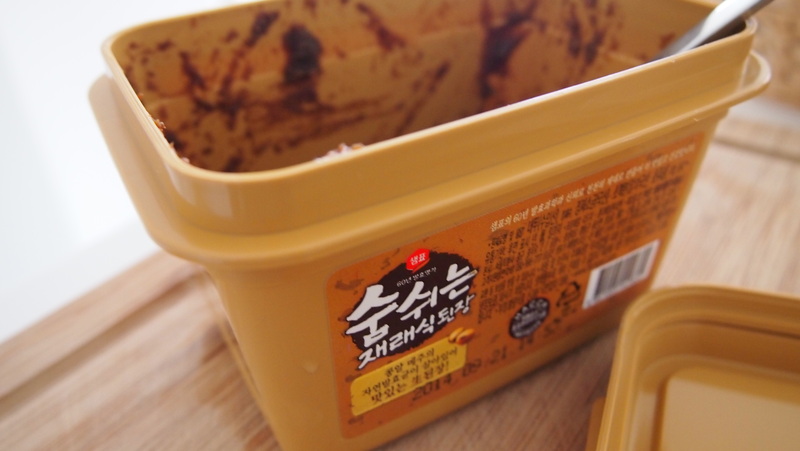 I personally prefer Korean brown beanpaste for the richness of its taste. You can also use the Japanese version, ‘miso’. 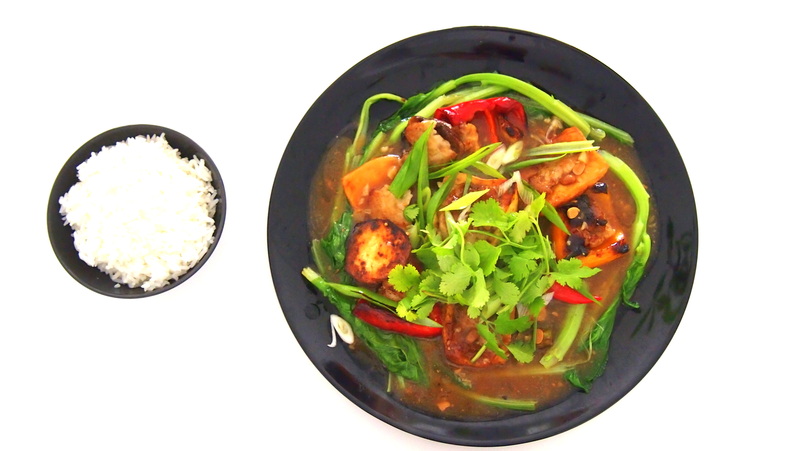 Have you tried the other recipes in my Yong Tau Fu series? Excellent dish. Thank you so much for sharing!